It’s such a random idea for a dessert though isn’t it? 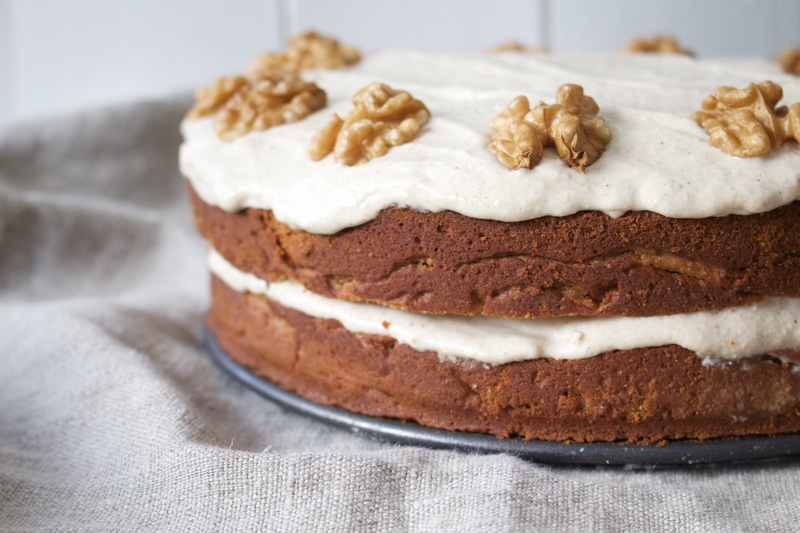 I mean I know these days there are sweet potato brownies or chocolate cakes that count beetroot or courgette among their ingredients, but vegetables hiding in baked goods seems to be a pretty new phenomenon, except for our beloved carrot cake. Not only bloody delicious, but so ahead of its time. And who thought up the idea of cream cheese frosting? Whoever it was, I salute them. Or I used to salute them, these days I’d probably ask them if they’d considered giving up dairy and point them in the direction of my blog. I’ve been messing around in the kitchen and I’ve come up with the yummiest carrot cake EVER, and it’s totally healthy and guilt free. Oh and it only requires nine ingredients (that’s including the icing)! It’s so super easy to make, and every time I’ve served it people have gone absolutely crazy for it. I really hope you’ll love it too! To make the cake, pop the pecans in a food processor and whizz for around a minute until they form a flour. Then pour into a bowl and mix with the ground almonds, buckwheat flour and cinnamon. Combine the grated carrot, banana, yogurt and maple syrup in the food processor and whizz until a thick, creamy mixture forms. Add this mixture into the bowl with the other ingredients and mix until a lovely batter forms. I prefer my carrot cake without any raisins or sultanas in, but if you want to add them in, now’s the time to stir them into the batter. Grease a cake tin or mould, pop the batter in and place in the oven at 180 degrees for 45-50 minutes, or until a knife comes out clean when inserted. 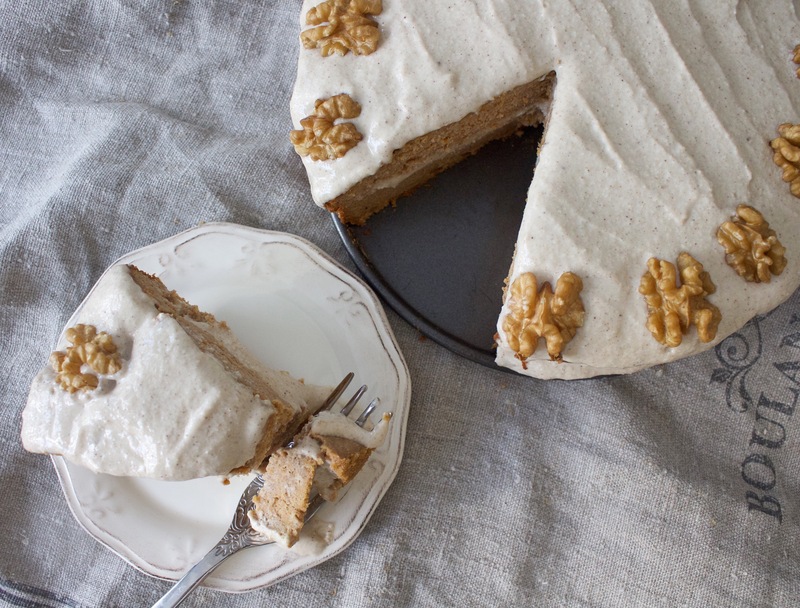 Leave the cake to cool for at least an hour (place in the fridge if you’re pushed for time!). To make the icing, simply pop the cashews (once you’ve drained them) in a food processor or blender and whizz for a couple of minutes until a smooth creamy mixture forms. Then add in the banana, yogurt, cinnamon and maple syrup and mix for a minute or so more until you have the most delicious icing. Spoon the icing evenly on top of the cake and there you have it! 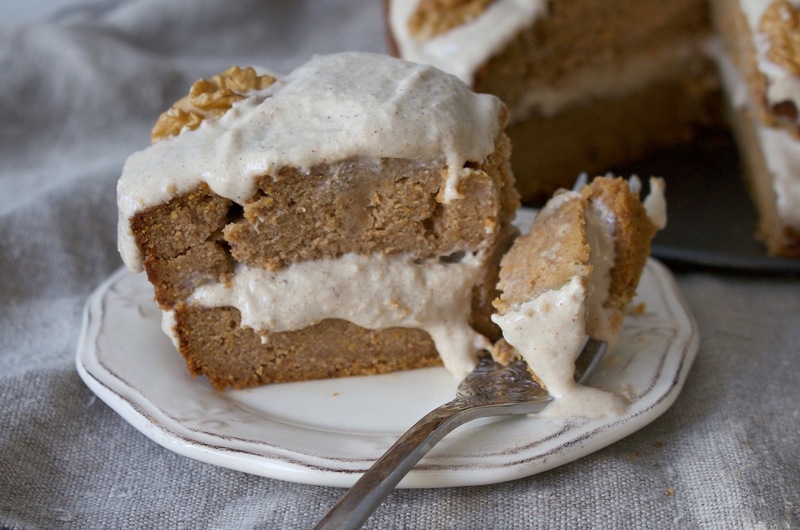 A super indulgent, secretly-healthy, oh-so-tasty carrot cake with creamy frosting – perfection!